I believe that low, in some cases zero or even negative interest rates will fuel the next crisis. When the next crises comes has not yet been revealed to me through my crystal ball but it is going to happen. A Bond Bull market means the price of bonds is high. The higher the quality of the bond, the higher the price. When bond prices go up yield goes down. Take a look at this graph from Bankrate.com that shows the dramatic decrease in yield from CD’s (certificates of deposit) over the past 30 + years. (WSJ article by Katy Burns) Later in this article I provide a link to that article for your review. Since safe bond prices go up when interest rates go down, you can see that safe bond income is very expensive today. This equation only matters if you want the safety of a portfolio of investment grades bonds to fund your retirement. How much yield do you need? Four percent seems reasonable. They say you can take four percent out of your retirement and it will last. So if your retirement earns 4%, you should be o.k. Alternatives are creative ways to raise money by pledging not just assets, but also cash flows to you the lender. You get a share of the assets pledged which could be a building or other hard asset. Or, the money you lent could be backed by an income stream such as someone else's mortgage or the cash flows from a business. They get even more exciting when a firm clumps them together, then dices them up again and sells you a piece of the pie. This is called a securitized debt. Look at this chart and you will see how these instruments proliferated before our most recent major market disruption in 2008. While ordinary investors should be averse to so complex an investment, many people fell for this type of “alternative program” time after time. If they could get more income life would be better. Sold as an income instrument CDO’s and their first cousins CLO’s (collateralized loan obligations) and CAO’s (collateralized assets obligations) CMBS (commercial mortgage backed securities) deliver higher income and higher total return when they work. In 2017 these investments are tempting for ordinary investments but even more tempting for institutions who must deliver more income than they can get from safe investments. Teachers unions, municipal pension funds, hedge funds are the big market for these investments. If you are a beneficiary of any of these investment pools, the risk is on you. Another sign that regulation has not mitigated risk is provided in an article by Katy Burns in the Wall Street Journal where they discuss the repo market. Repo's buy bonds with borrowed money sort of like buying stocks on margin. Repo's are now processed by only one bank. Whenever one institution is a key to this much debt, systemic risk is real. In this article, a debt instrument called "whole business securitization" is popular among restaurant stocks. They can pay a little less interest than they would have to pay in the junk bond market. The securiter matches this need with investors who need more income than an investment grade bond can deliver and they sell this new idea as safer because you own a piece of the business. As Eisen notes, the lender and borrower have to iron out what happens to the debt in a bankruptcy. But the pressure is on and these loans are increasing. Eisen states the volume of these types of loans is greater than occurred before 2008. This "whole business securitization" came about in the U.K. in the 1990's. Lehman Brother's borrowed (pardon the pun) the idea in the run up to 2008. We all know what happened to Lehman Brother's; bankruptcy. Actual personal history is important to me. I have been through many market crashes beginning with 1987. The October 1987 crash was not too bad for me. I was able to refinance my mortgage as rates went down and still I could use my savings to buy a 1-year C.D. for 7%. I didn’t own enough stock or enough real estate to be affected by the stock market crash. All I cared about was working. I had no idea about synthetic investment but the junk bond debacle was the fuel of that awful fire. I got through it because I was young and working. Retirees had it a lot worse. In the early 1990’s I decided to join this business of investment advising. The 1992 and 1994 recessions were challenging. Already in my early 40’s, I knew that creating investment income to replace my working income and my spouse’s was the single most important financial goal of our investment plan. I started to use these market disruptions as an opportunity to employ cash. During the early to mid 1990’s we created cash by spending less than we made; better known as savings. Every extra dollar went to investing for our future income. By the time the next major disruption occurred in 2001, I was still working but my husband had retired. The dot com crash of 2001 was painful. It tested the theory that it doesn’t matter what your portfolio is worth, what matters is what income it creates. The absolute worst scenario is to have the market crash just when you retire. In 2001, I couldn’t afford to sell because I needed the income from our portfolio of quality dividend stocks and some quality bonds we so carefully built and the real estate I invested in that an MBA classmate of mine put me into. A few stocks did reduce the dividend and many suspended increases. But, most quality dividend stocks continued to pay their dividend every quarter although their stock values were down. We recovered from 2001, although it took 16 years for the Nasdaq to get back to its 2001 highs. During the next 15 years bonds yields and therefore, safe income continued to deteriorate. Bond values increased and I sold many bonds at premiums to par and well above where I bought them. This bond bull helped to salve the bear stock market of 2001. The 2008 bear market was a rout for every investor. Every safe investment was suspect. Even money market funds were in trouble. Real estate wilted, credit markets were in total disarray and stocks prices plunged. What occurred between 2001 and 2008 that allowed my family to weather the storm. Dividend income. Again some of our stocks reduced their payout but only about 10%. 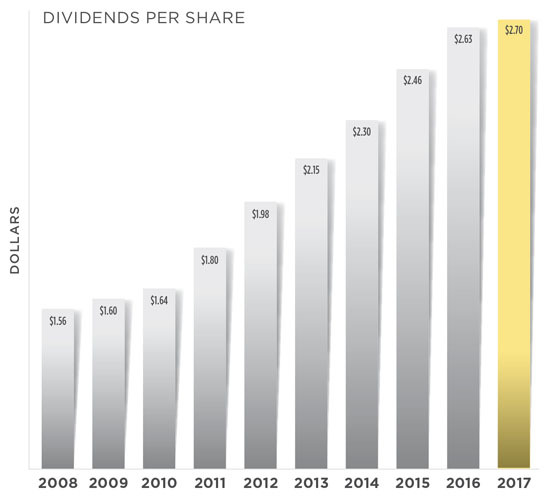 Some continued to pay but did not increase the dividend. Others were able to continue dividends and increases. If you stick to a strategy you can use these opportunities to add to dividend growers at very low prices. Very low prices occur when there are major troubles. Look at those quality stocks that made it through 2008 and still paid dividends. Those are the stocks to invest in until bonds are cheap. Here are few of the stocks that made it through the past market disruption and are highly likely to continue to deliver income during the next one.